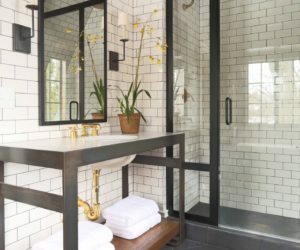 Tiling a floor or a backsplash is one thing; tiling a water-heavy area like a shower or tub surround might seem like an entirely different story. But, truthfully, the process of tiling is similar in all these instances. 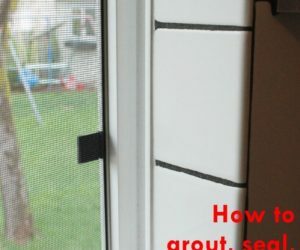 Just a few tweaks of strategy and technique, and you’ll be able to successfully tile your tub surround (or shower) in the most water-safe way possible. 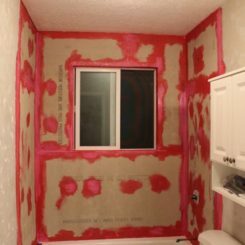 You may have already read our articles on how to remove old tile from a tub surround and how to prepare a tub surround for tile. 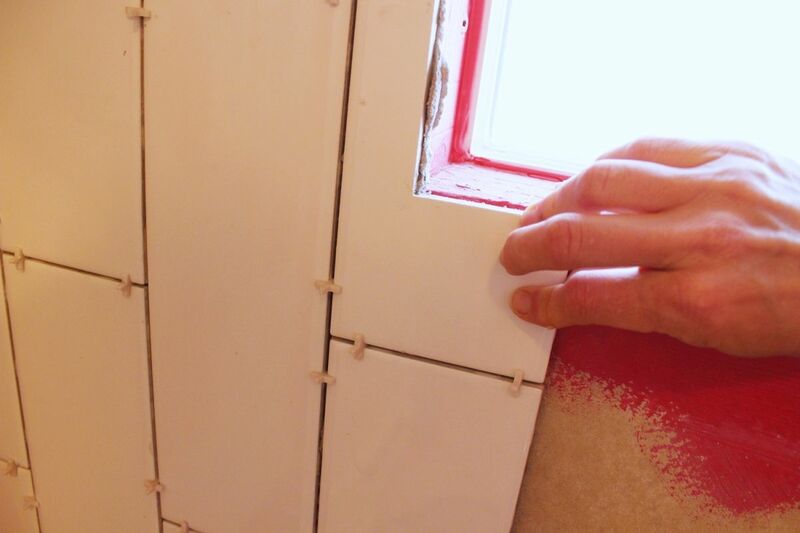 This tutorial will walk you through the steps in tiling a shower that not only looks amazing, but that functions perfectly for you, your family, and/or your guests as well. 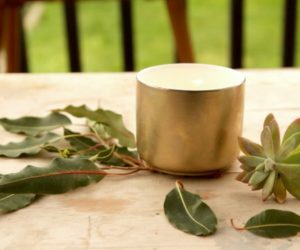 It’s a process that requires patience and precision, but it’s not terribly difficult. 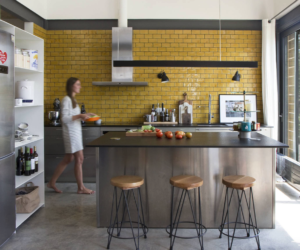 Before you begin actually tiling the prepped walls, it’s a good idea to determine where to start, and if starting with a full tile is in your space’s best interest. 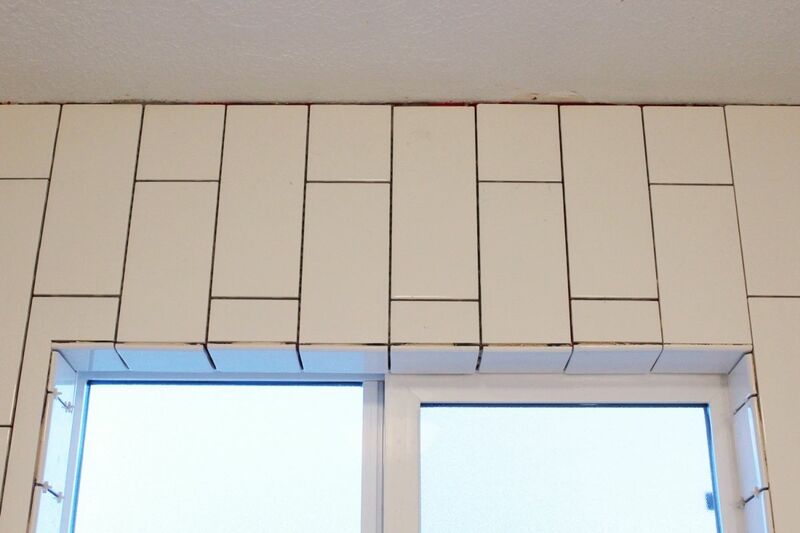 The last thing you want to do is begin throwing tiles up on the wall and realize that your last row needs to be 1/2″ tile strips, or something similar. You can purchase powder thinset or pre-mixed thinset. 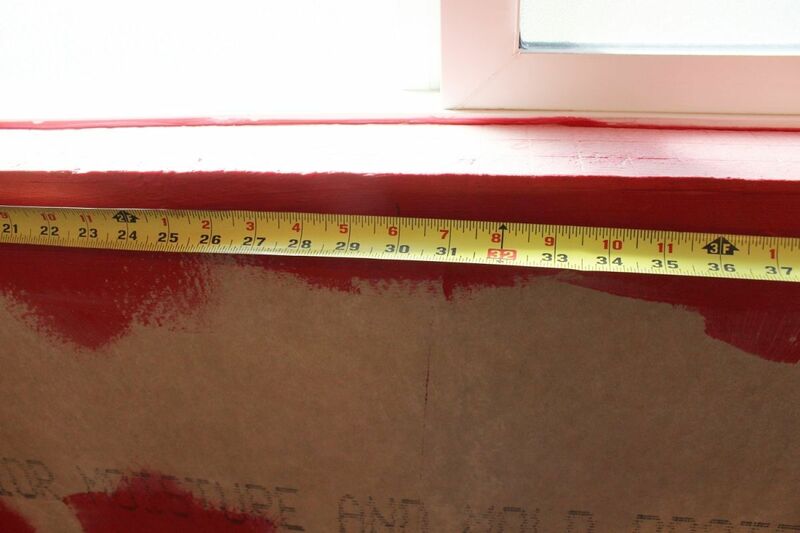 For this tub surround, we used about 4-1/2 gallons of premixed thinset – you may use more or less, depending on the cut of the trowel you use and the size of your tile, but that might help in your estimations. 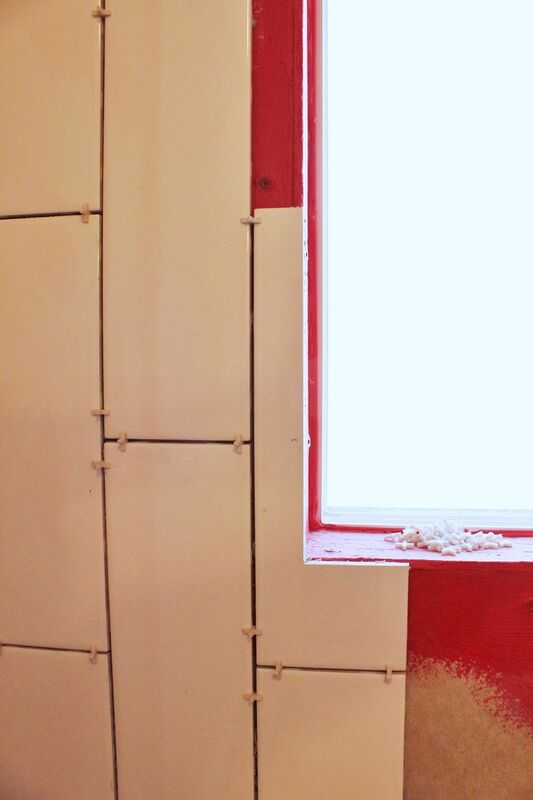 Tip: If you plan on using a white or light-colored grout, choose white thinset. 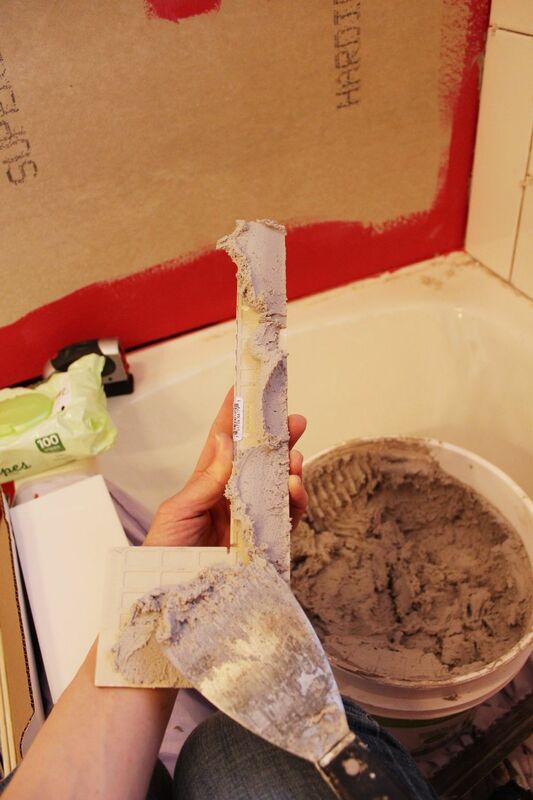 If your grout will be grey or dark-colored, use grey thinset. 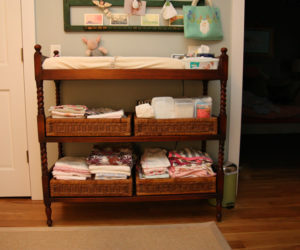 Wherever your starting point is, spread thinset in that area in about a 2’ square space. 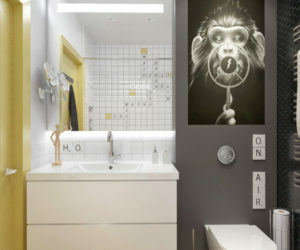 You don’t want to go too big with your thinset spaces, because it will start to dry before you get all the tiles placed. 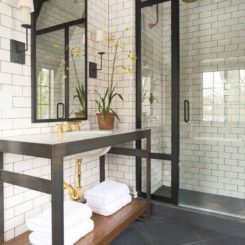 Neither do you want to spread thinset on a tiny space, because that takes a lot more time to tile the whole shower that way. 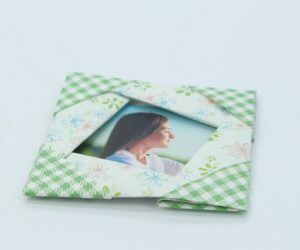 It also increases the likelihood of an uneven tiled face across your wall. 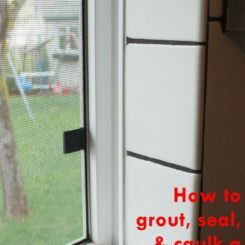 Tip: Not shown, but highly recommended, is to lay painters tape along any adjoining surface that you don’t want thinset on. 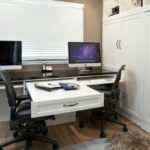 This stuff can be messy, and your cleanup will be much easier with a bit of prep. 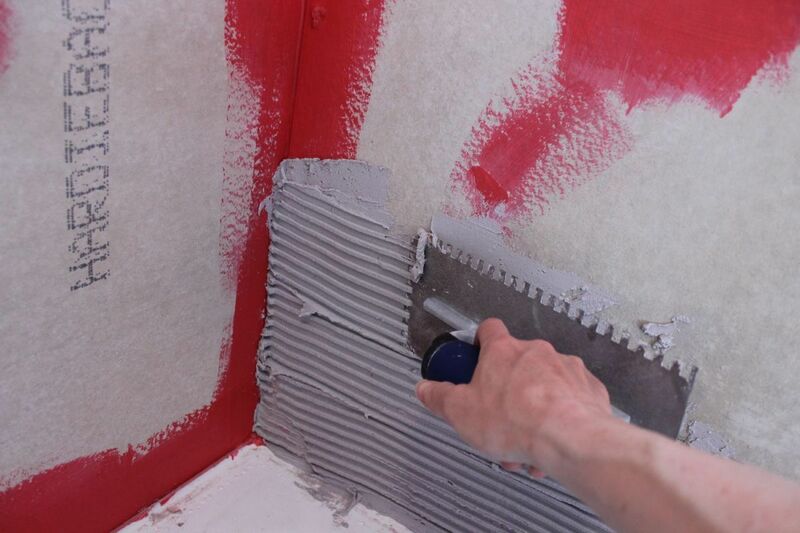 Run your trowel over the thinset to create lines. 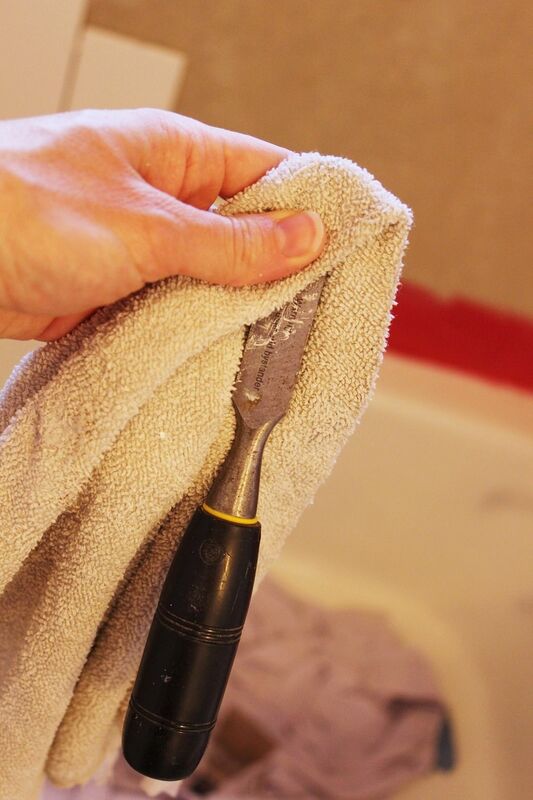 Horizontally or vertically, it doesn’t really matter which direction your trowel goes. The important thing is that each of the “crests” of thinset are of equal depths in terms of coming out from the hardibacker. 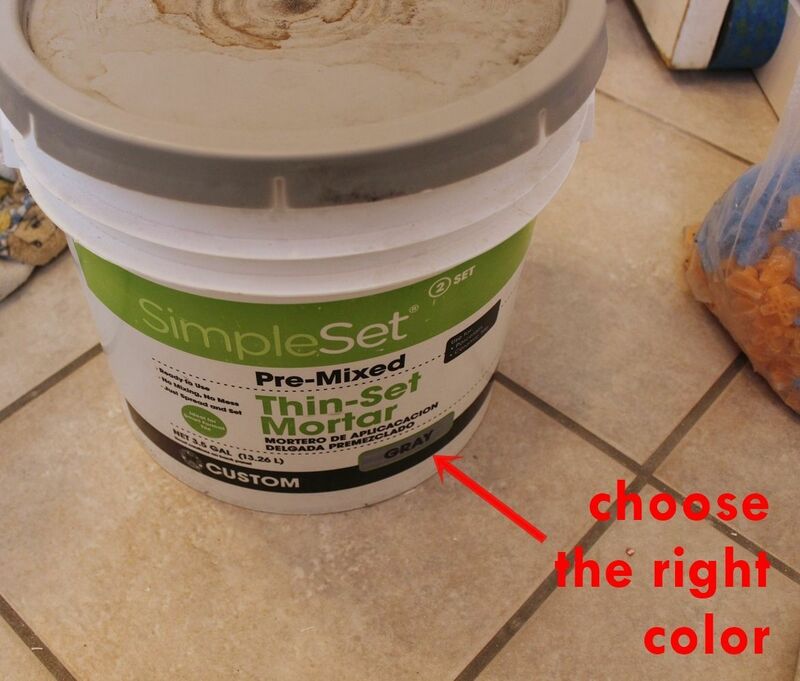 This is key for a smooth finished tile surface. 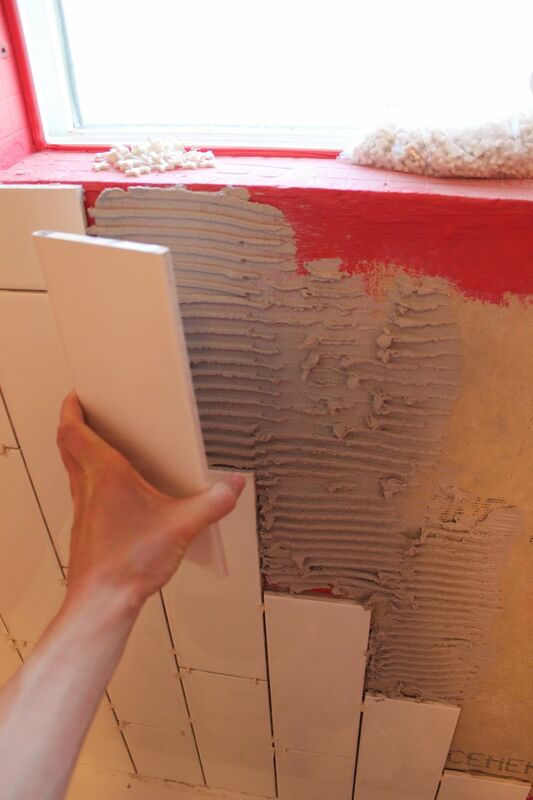 Place your first tile in the thinset, pressing firmly and with even pressure. 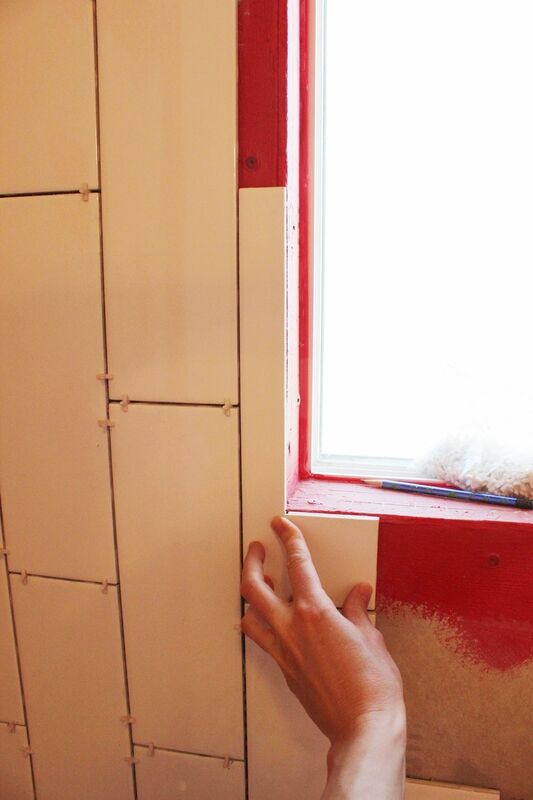 Use a level along the top edge of the tile to make sure you’re starting out square. 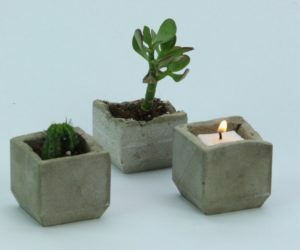 This is critical, particularly on these first few tiles, because they will be the foundation for laying the rest of the tiles. 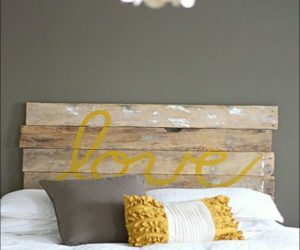 If the first one is crooked, it’s likely that the rest of your wall will be crooked. Take a little more time here at the beginning to get it perfect. 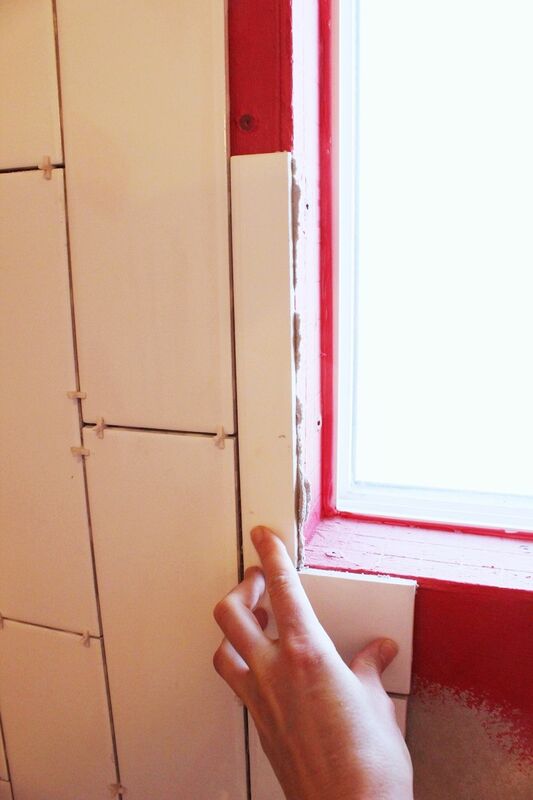 Make any adjustments necessary to get the tile completely level – both from the front and from the side. Then move on to your next tile. 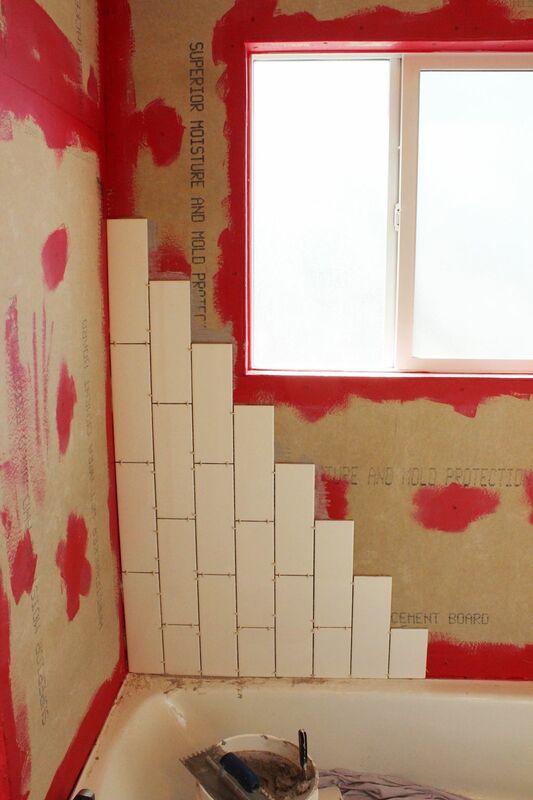 If you are starting your tiling in a corner, I recommend laying the tiles in a format I like to call the “staircase process.” It provides plenty of support for each tile and keeps every row and column exactly in line with its neighboring rows and columns. Basically, this means lay your tiles down like stairs, working from the top down as you expand the number of tiled columns. 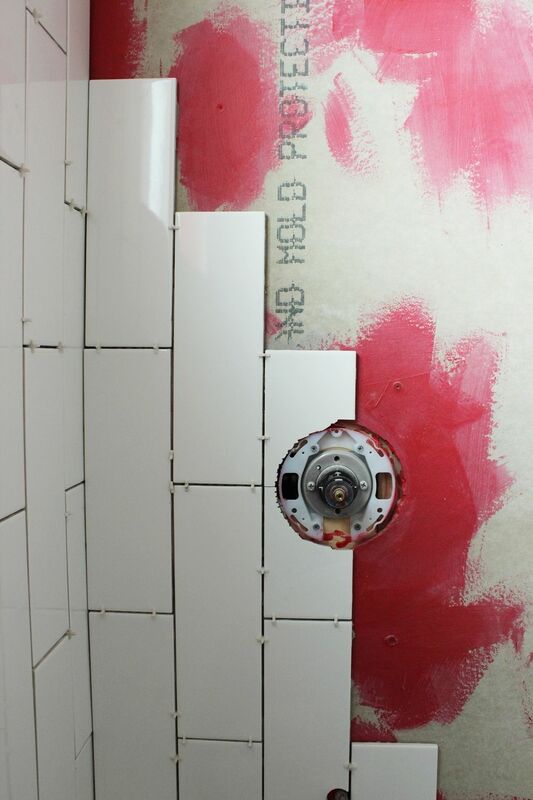 As each tile is placed, you will be pushing it into the thinset to create a flat tiled face. Sometimes, some thinset might squeeze out between the tile and an adjacent tile. 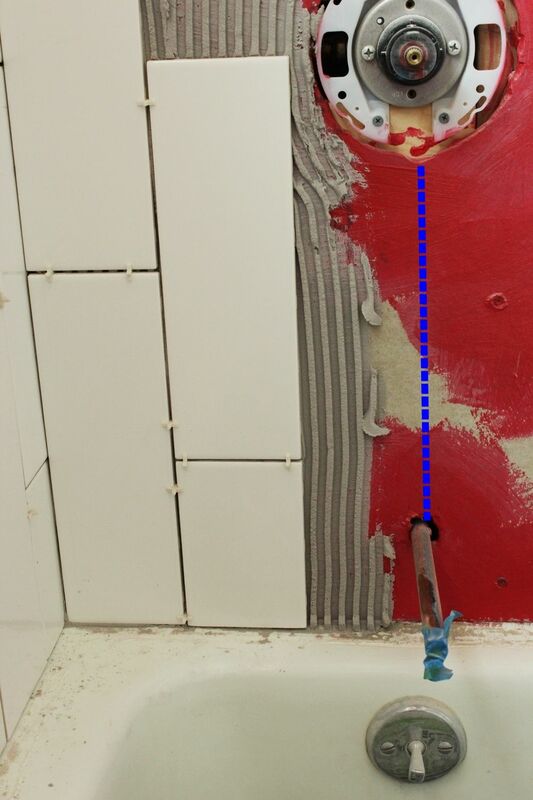 You want to remove this excess thinset, because that gap needs to be kept clear for grout. 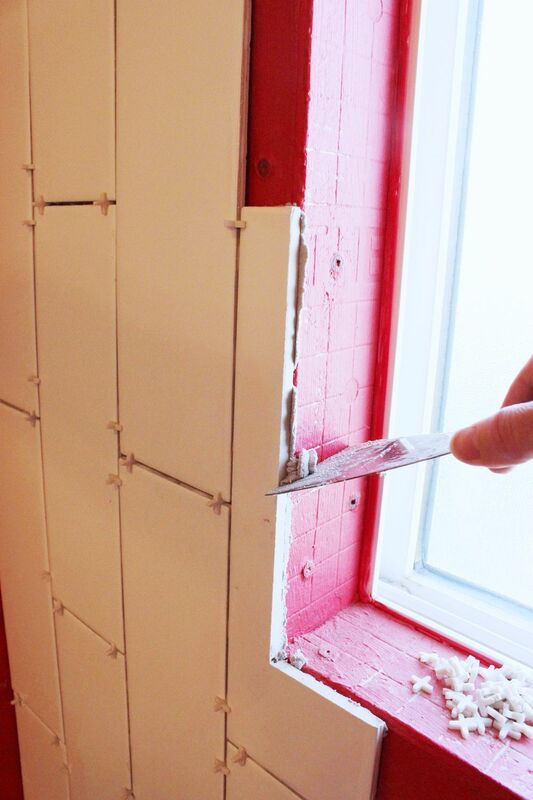 Tip: Use a spacer to scrape away any extra thinset in the gaps. You can see a bit of extra thinset that this spacer wiped away. I tossed these bits back into my thinset bucket because they were still moist; however, if they’ve started to dry for some reason, you will want to toss them out. You’ll find your groove pretty quickly, especially if it’s a plain wall with no obstacles or obstructions. 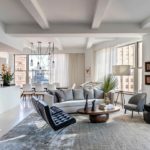 However, tiling a tub surround or shower is a big job, and there’s a good chance that the realities of your life won’t let you finish it in one fell swoop. 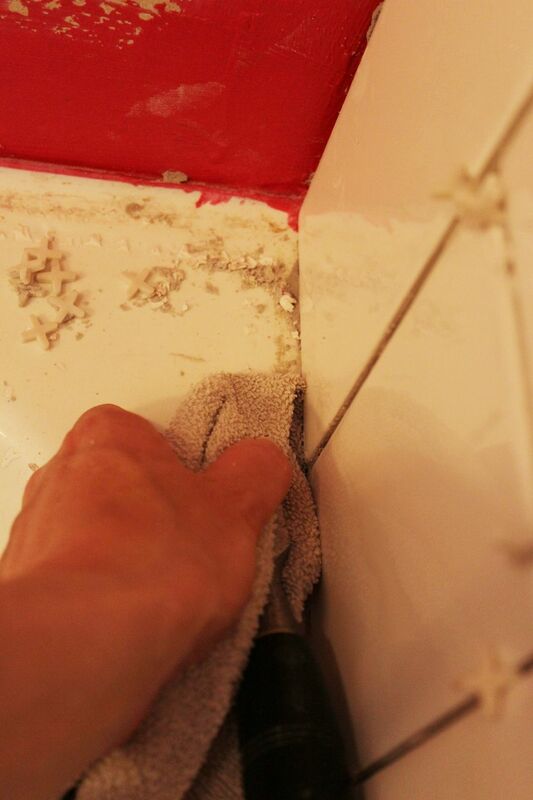 If for whatever reason you need to take a break, simply wipe away any exposed thinset with your putty knife. 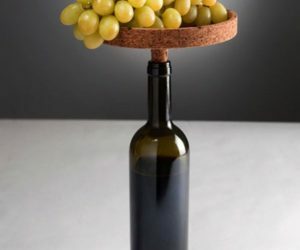 You want the surfaces next to every tile’s edges to be smooth and flat, so that you can easily pick up where you left off with laying fresh thinset. 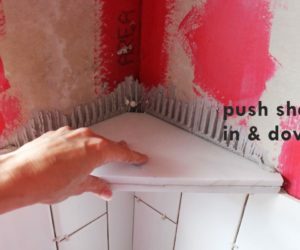 If you do have to pause tiling for a while, it’s a good idea to wipe off any thinset drips while the thinset is still wet. 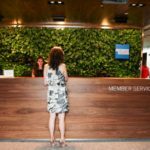 This will save you so much time and effort in the long run. If, however, you miss some drops, and they harden, all is not lost. Take a file and an old towel. Double the towel up and wrap it around the file blade. 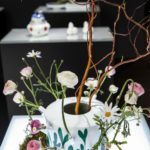 Being careful that the file blade never touches the porcelain (it can chip the porcelain), scrape away any dried bits of thinset. 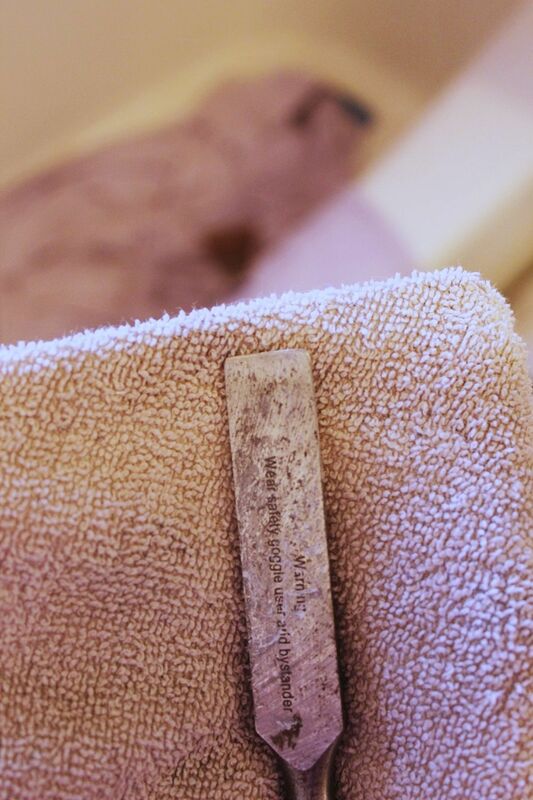 If the blade starts cutting through the towel, reposition it in another section of towel. 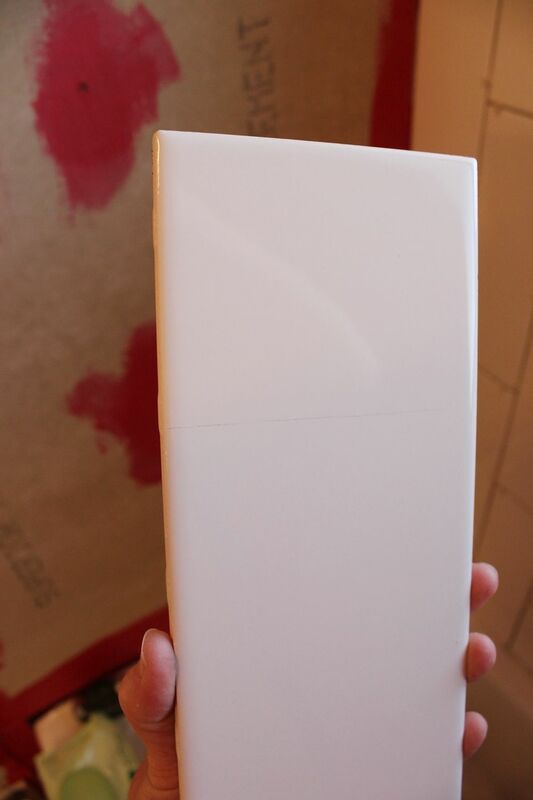 There should always be a towel buffer between your file blade and the porcelain. Continue this staircase process for as long as you can, working your way down each staircase. 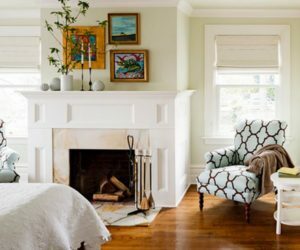 Although it’s best to lay thinset over a relatively large space, you may run into instances where you need or want to lay single tiles. 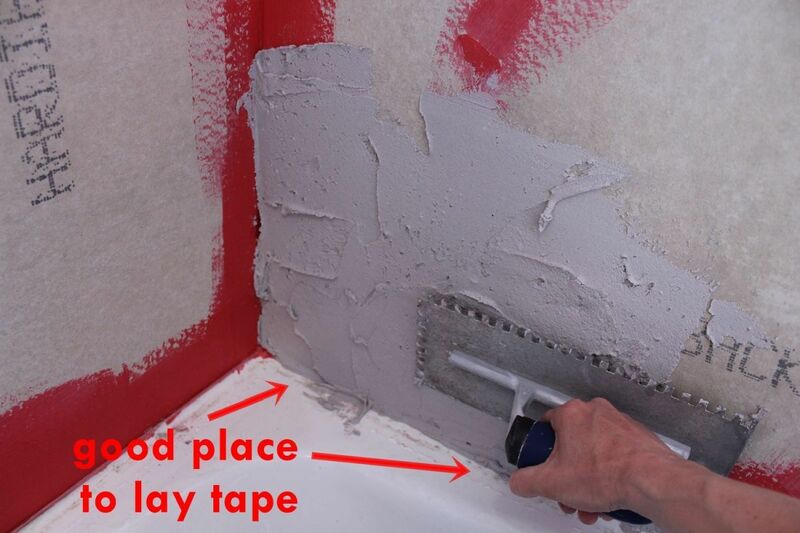 Do this by spreading thinset onto the back of a tile, then troweling your lines at the same depth as what you’ve been doing on the walls. 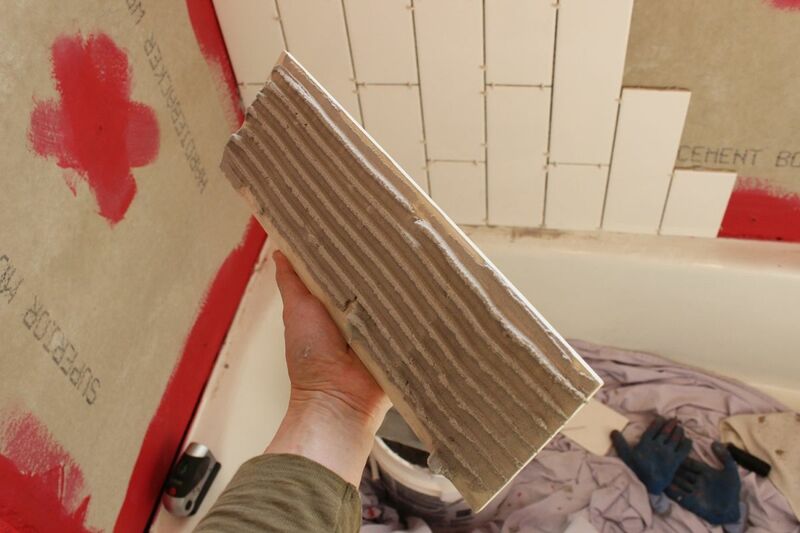 Tip: You can slightly adjust the trowel line depth by changing the angle of your trowel as you make the sweep – the more perpendicular your trowel is to the tile, the deeper your thinset will be and, consequently, the higher your tile will sit off the hardibacker. 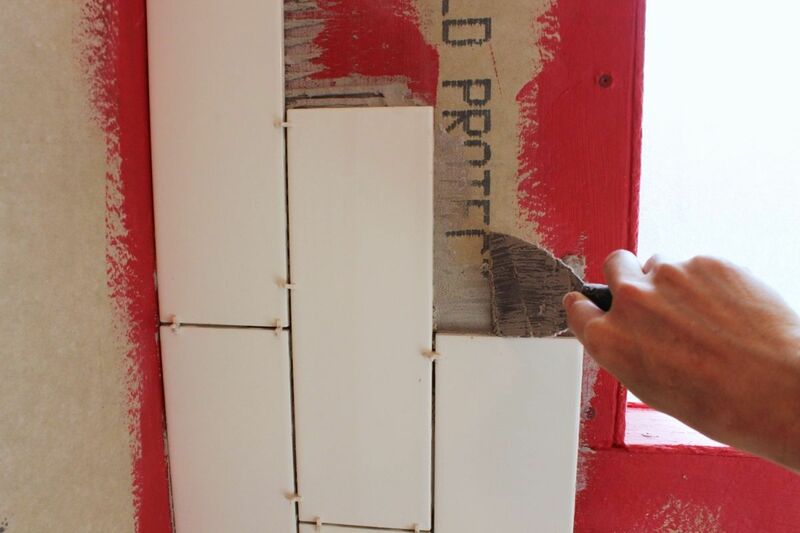 With your troweled tile back, you can place the single tile in place. 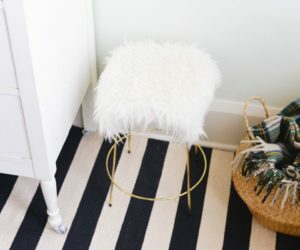 Take care to push it in toward the wall with even pressure on all edges and corners so that the tile lines up flush with its neighboring tiles. Add spacers just as you do when every tile is placed. 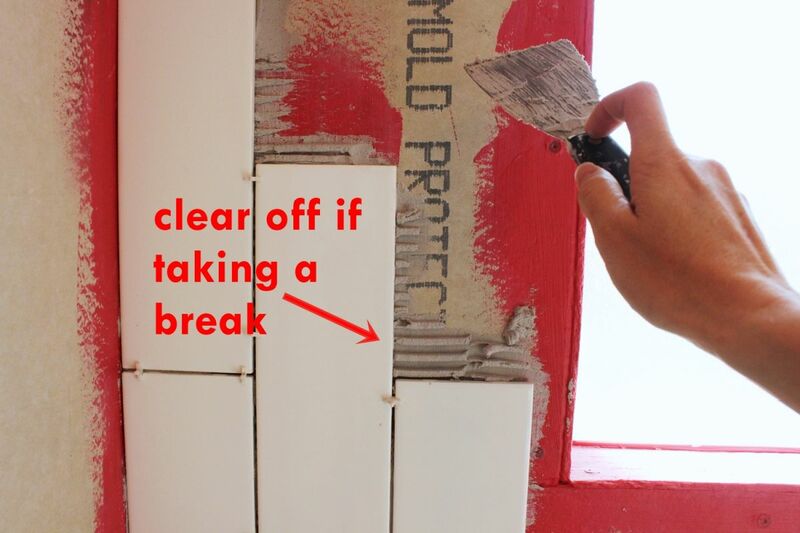 Tiling around obstacles such as tub or shower fixtures, shelves, or windows, will require a bit more time and patience (and, most likely, tile cuts). At this point in my staircase method, I needed to cut an L-shaped tile to continue the staircase. 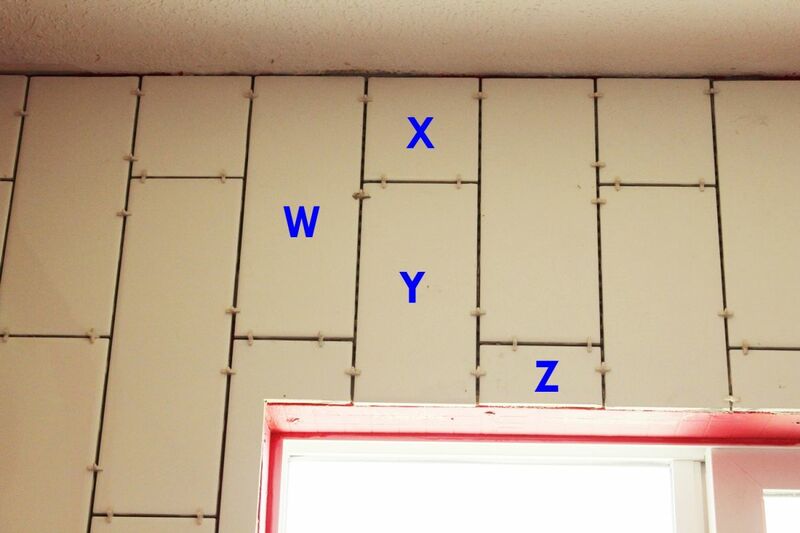 Hold up a whole tile in the spot, double-checking the spacing (you can even add spacers here if you’d like). 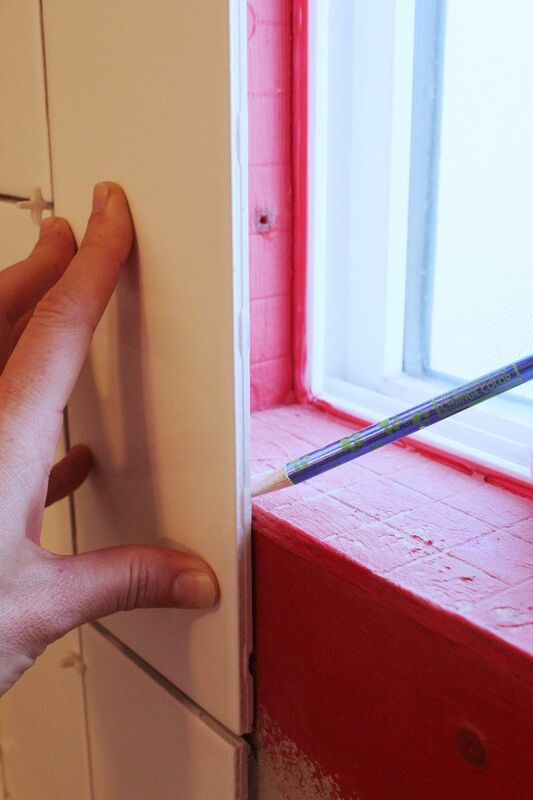 With a pencil, draw along the edge of the window an outline of the L to be cut. 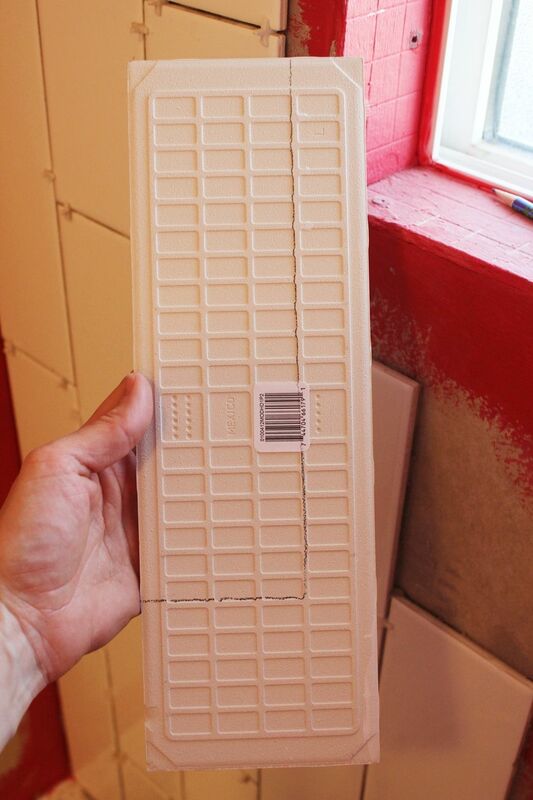 Tip: You can also make these measurements and draw onto the front of your tile accordingly; however, if possible, this method tends to be more accurate and efficient than making measurements and accurately transferring them, simply because there are fewer steps to allow error. Your lines will be on the back of the tile, so you will need to carefully extend those lines onto the tile edges so they’re visible on the front of the tile. 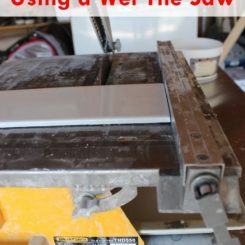 Then follow this tutorial on how to use a tile wet saw to make your cuts. 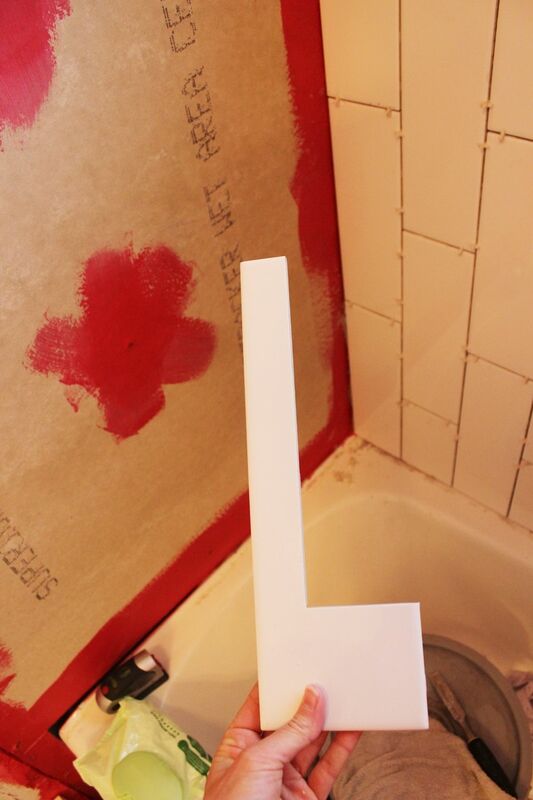 So you’ve cut your perfect L-shaped tile. Nice work. 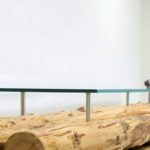 Dry fit it into your L-shaped space; if it looks like a perfect fit (which it hopefully does), you’re ready to attach it. 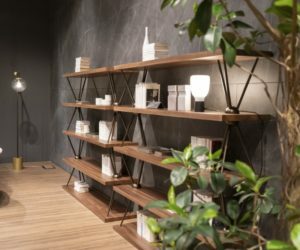 Because the L-shaped space itself might be tricky to apply an even layer of thinset onto directly, this is an instance where applying thinset onto the tile itself might be more accurate and effective. 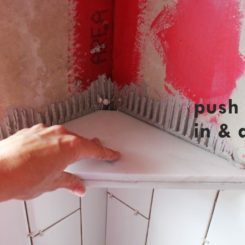 So spread on a bit of thinset to the back of your cut tile. 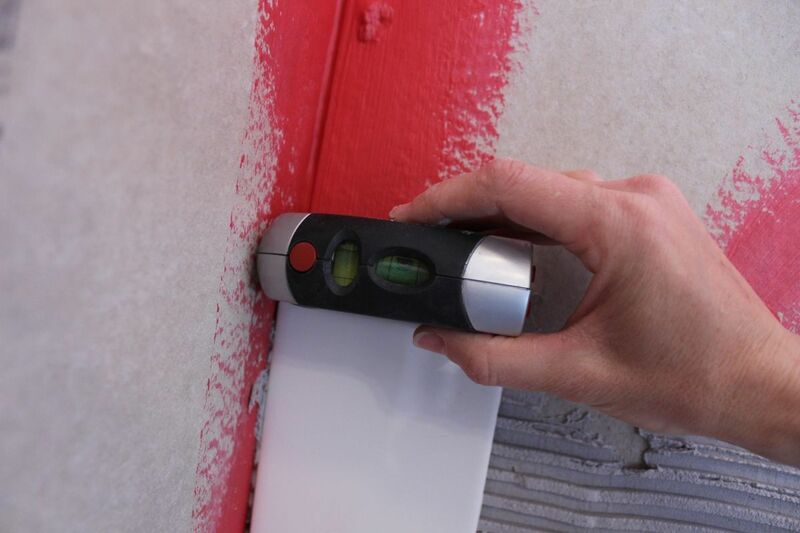 Run your trowel over the thinset to create your even lines. Attach the L-shaped piece into its space, pressing firmly and evenly so the face of this tile is flush with the faces of its adjacent tiles. 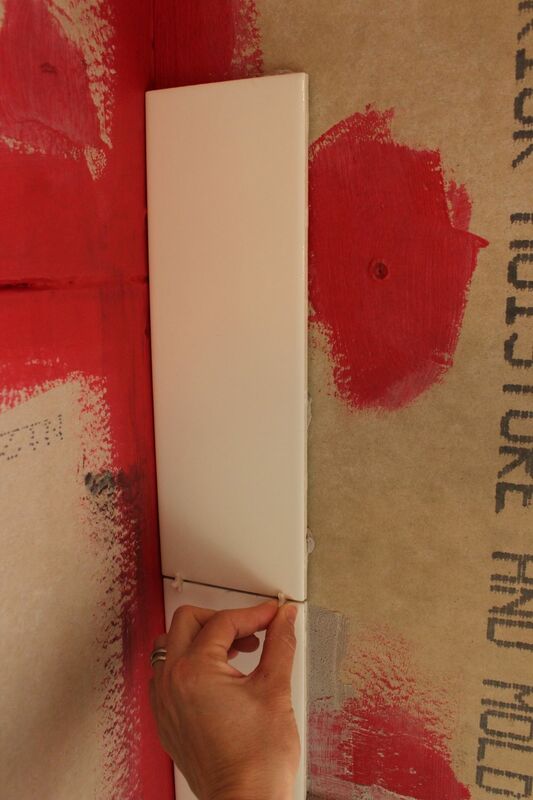 Adjust angles so it’s squared up, then place spacers in the gaps to hold it in place. 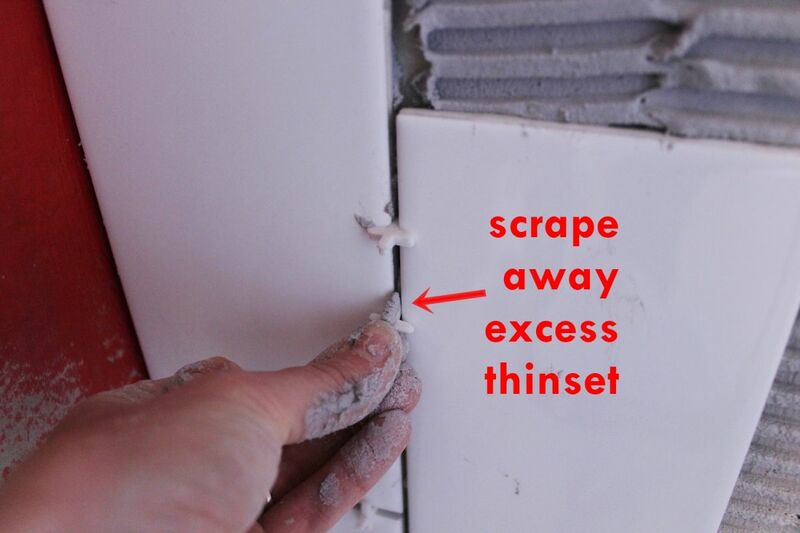 Scrape away any excess thinset, if applicable, from the sides of the newly placed tile. 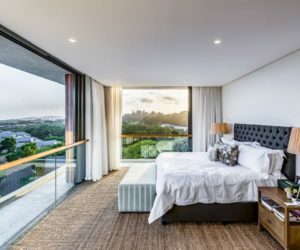 You want the window sill to be completely smooth and flat for when it’s time to lay those tiles. Step back. It looks great; you now know how to effectively and efficiently cut oddly shaped tiles and lay them around obstacles. 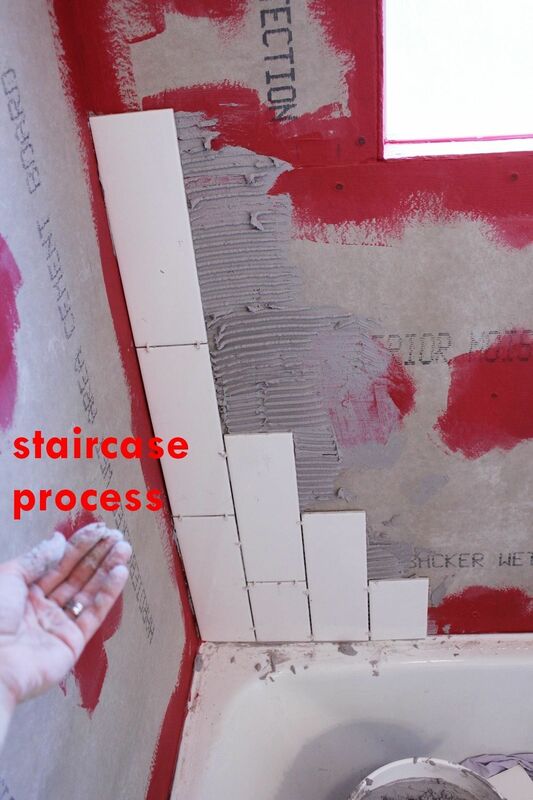 Continue your staircase method of laying tiles. For the next tier of the staircase method, you may need to simply cut off part of a tile. You can also use a measuring tape for this cut, but I preferred the hold-tile-and-draw-line strategy. 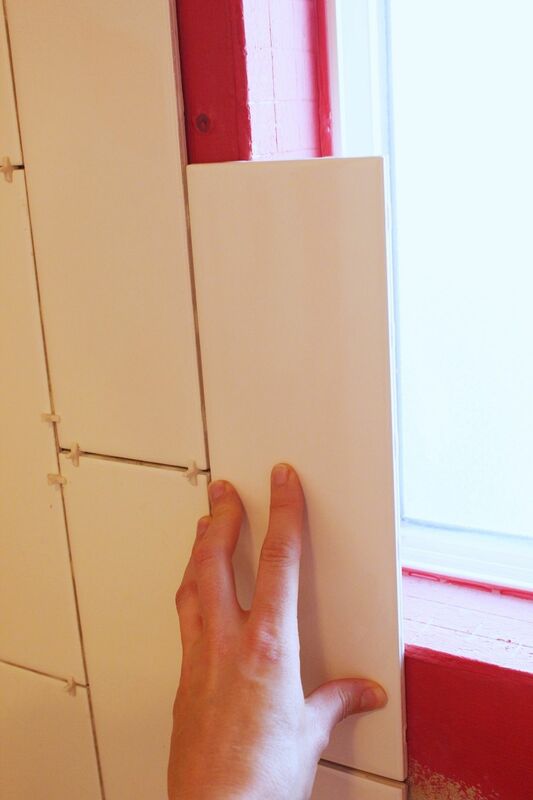 For straight cuts, you can hold the tile up with the face toward the wall when you draw your line so that your line is drawn directly onto the tile face (as opposed to the line on the back of the tile). 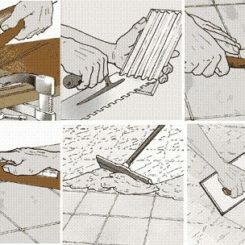 This only works for straight cuts, though – don’t do this for L-shaped cuts or anything else fancy, or your cuts will be exactly opposite of what you need. 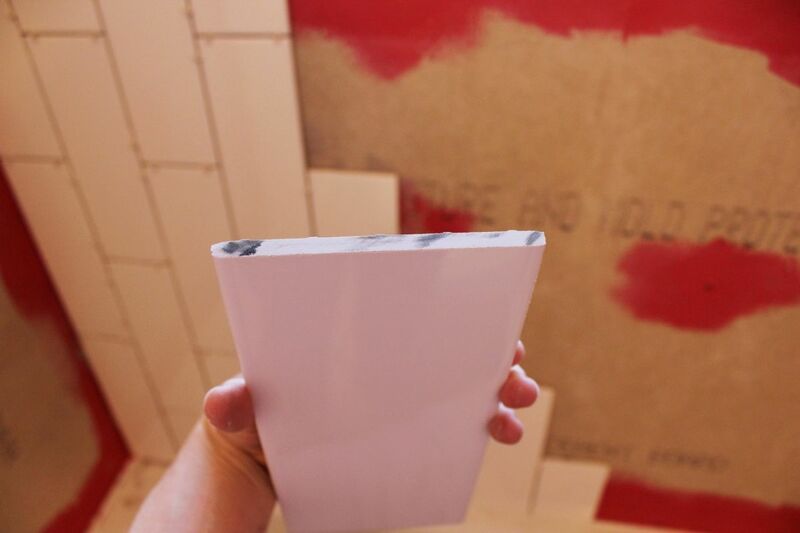 After you’ve made your straight cut, your tile will have one factory-cut end and one tile wet saw-cut end. Whichever cut you made should be placed away from the rest of the tiles, if possible, because it will likely be sharper and not slightly tapered like the factory tile edges. 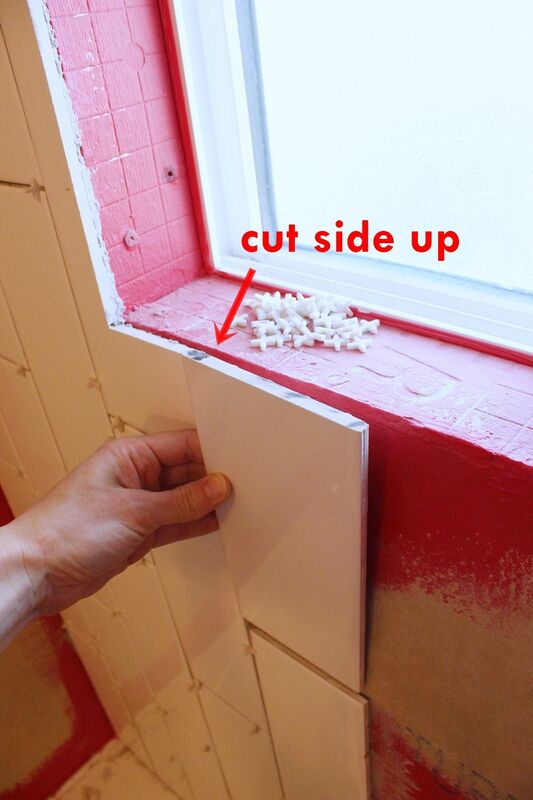 In this case, place the cut side up toward the window because it will be covered with bullnose tile when we go to tile the window frame. Do a dry fit to make sure your cut is perfect; adjust if needed. 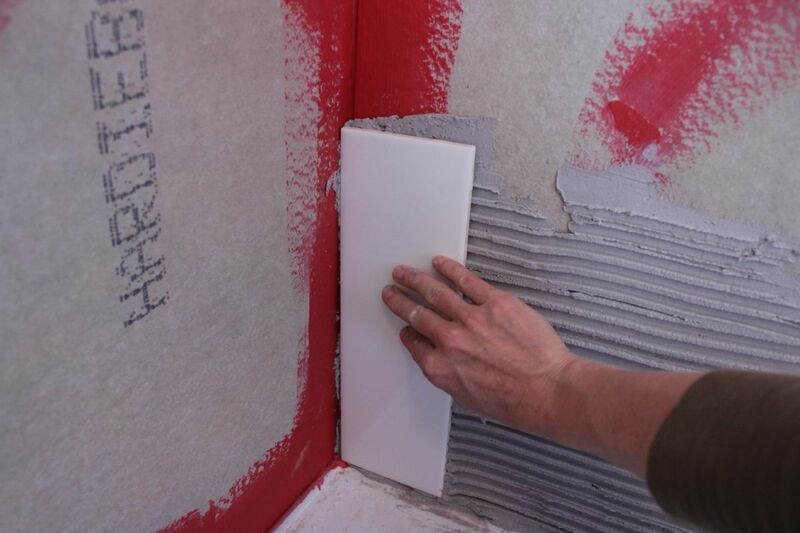 Then trowel on your thinset and place the tile for real. 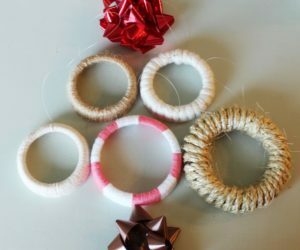 Add spacers. 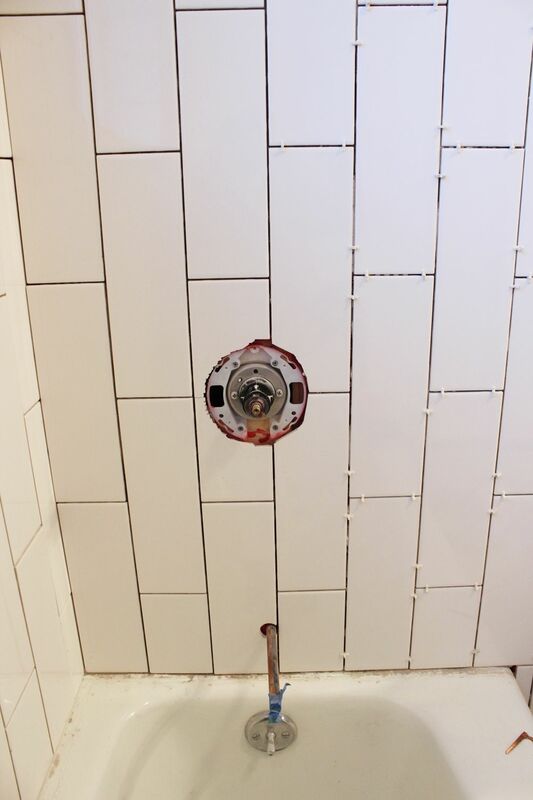 Another obstacle that you will likely run into when tiling a shower or tub surround is the plumbing fixtures, such as the tub faucet, mixer valve, or shower head. As you can see from the photo, this tub faucet falls directly in line with a tile. 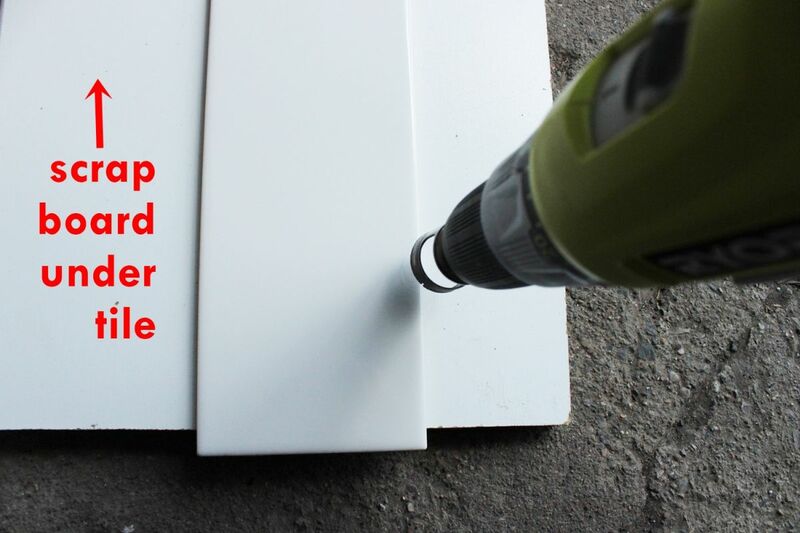 This tutorial shows how to use a tile drill bit sized perfectly for just such piping. 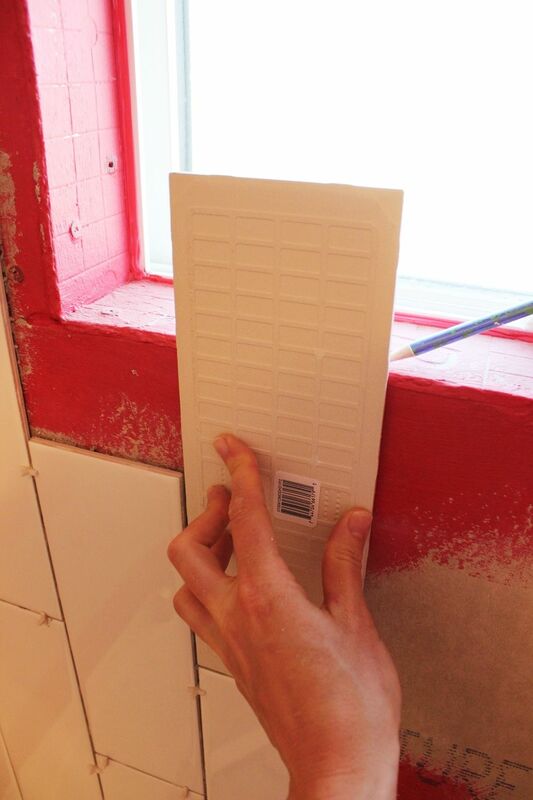 Measure and mark on your tile where your cut will need to go. 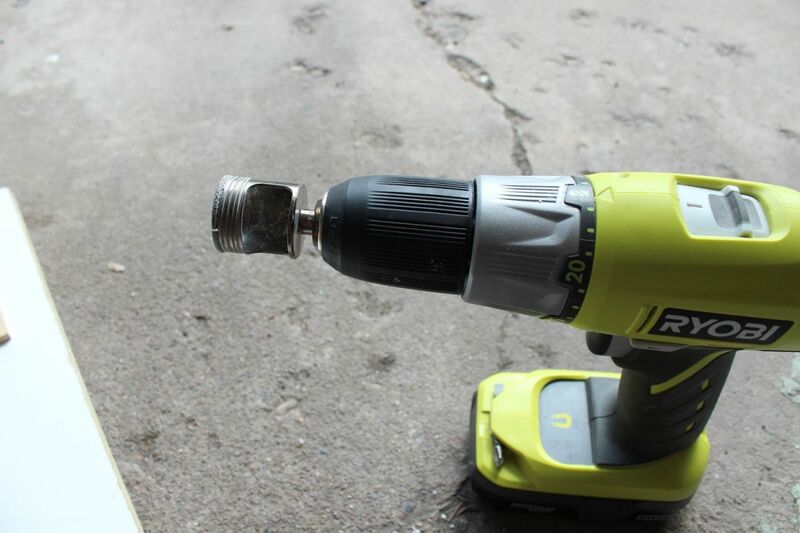 Attach the tile bit to your drill. This is a diamond blade, and you can see here that it’s a round blade that’s hollowed out. 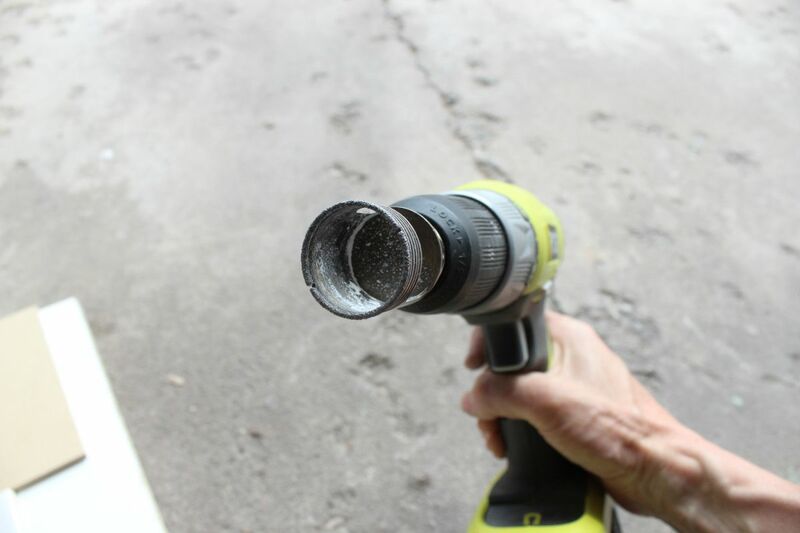 The bit is 1-1/8” in diameter, a perfect size for standard 1/2″ pipe outlets (or even slightly larger). 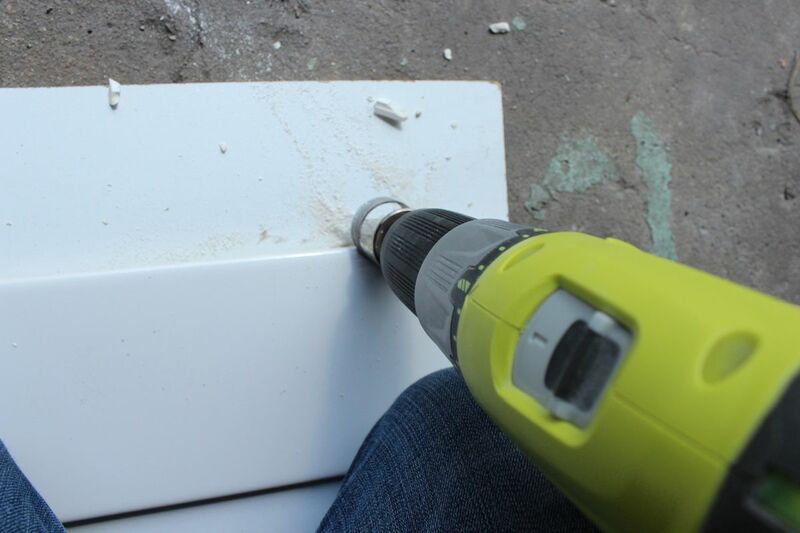 Place your tile on top of a scrap board so that when your drill bit gets through the tile it has somewhere “soft” to land. 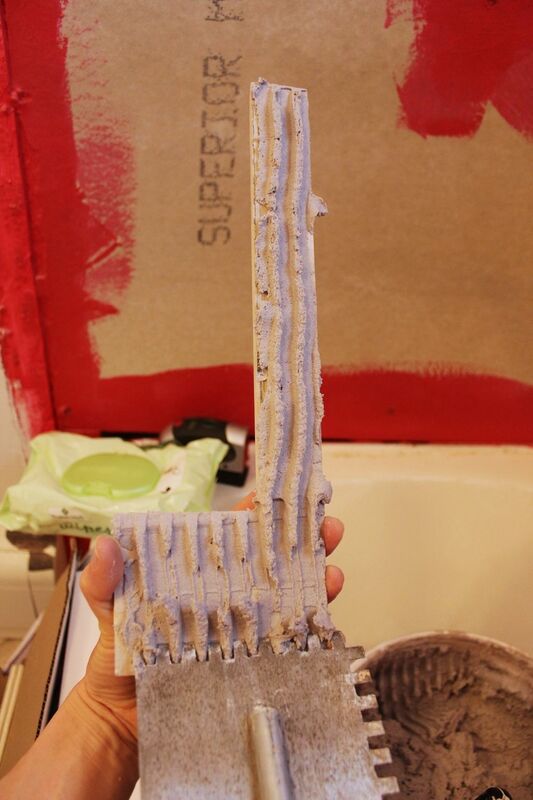 You will probably want to practice on a scrap piece of tile, as the drill bit takes a little getting used to. 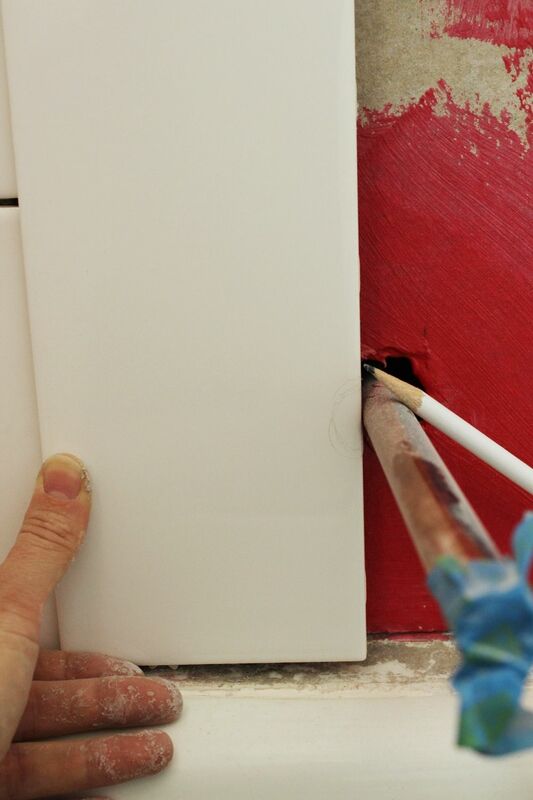 I recommend having a partner help you hold the tile securely as you drill. 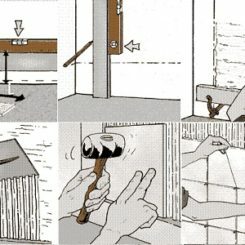 If you don’t have that option, however, secure the tile with your knees so you have both hands free to push – HARD – on your drill until the bit “takes.” I found it most effective to place my drill at a slight angle rather than aimed directly perpendicular at the face of the tile, but this might be just personal preference. Drill out your circle bit. 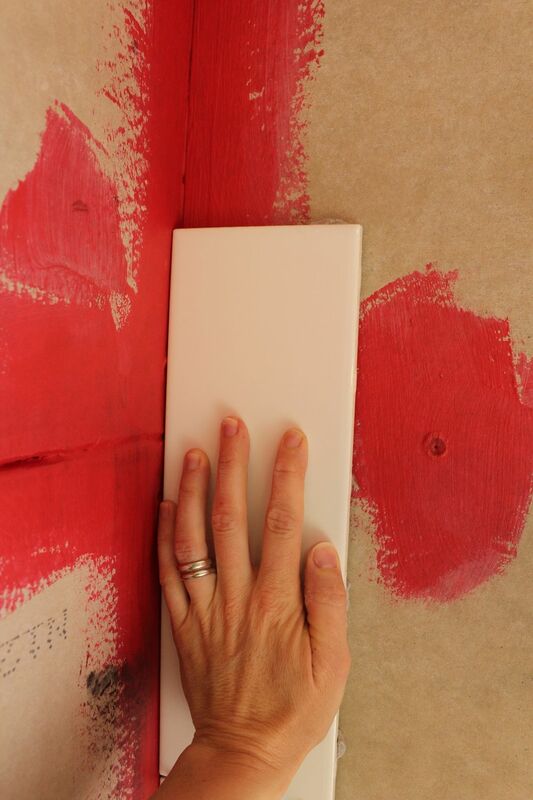 Dry fit your tile; if it fits perfectly (fingers crossed! ), then install it with your thinset. 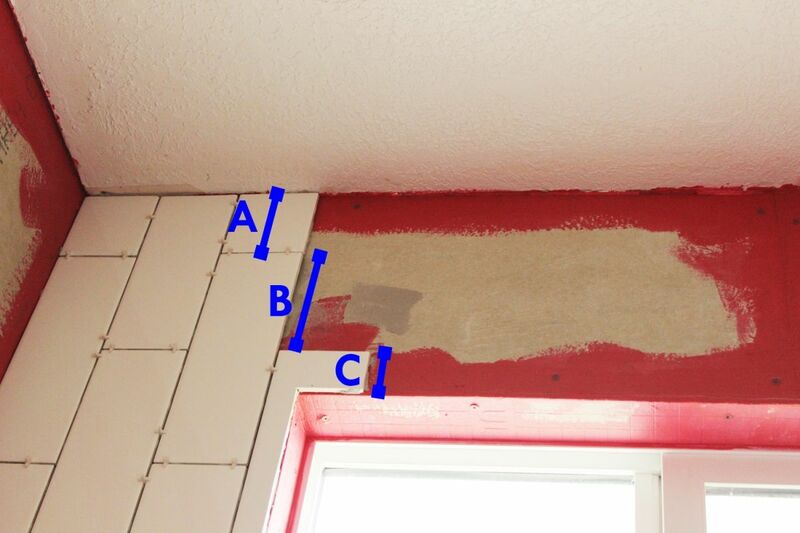 Continue your staircase method on this wall and all others until the entire tub surround/shower is tiled. 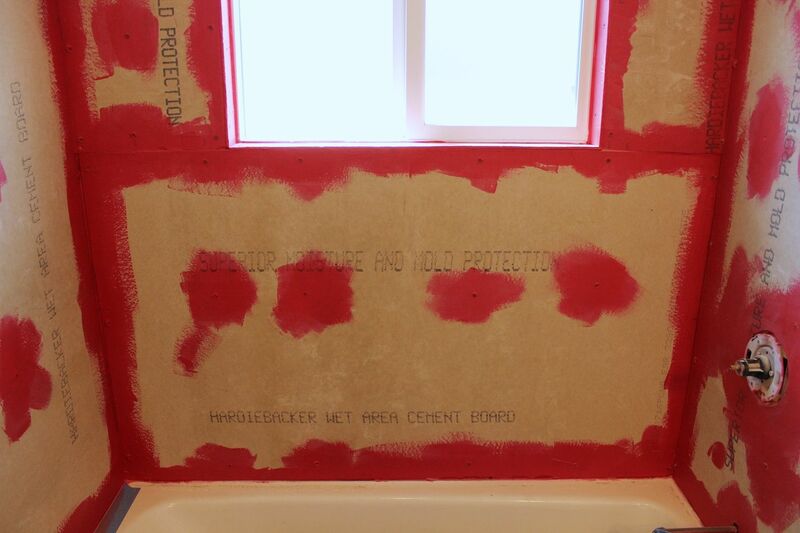 Last, if your shower or tub has a window, you’ll want to lay bullnose tile on the inner window sill surfaces. 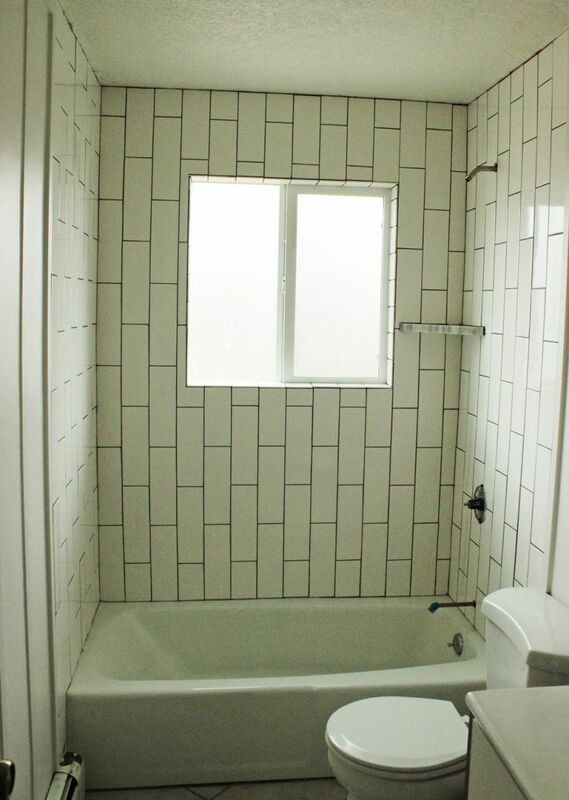 Many tile types have bullnose tiles available; this oversized subway tile (4”x12”) had accompanying 4” bullnose squares, which were perfect for this window sill. The important thing to remember with this bullnose tiling is to keep the bullnose-to-tile-edges smooth and even so there are no sharp tile edges exposed or places for water to inadvertently pool. 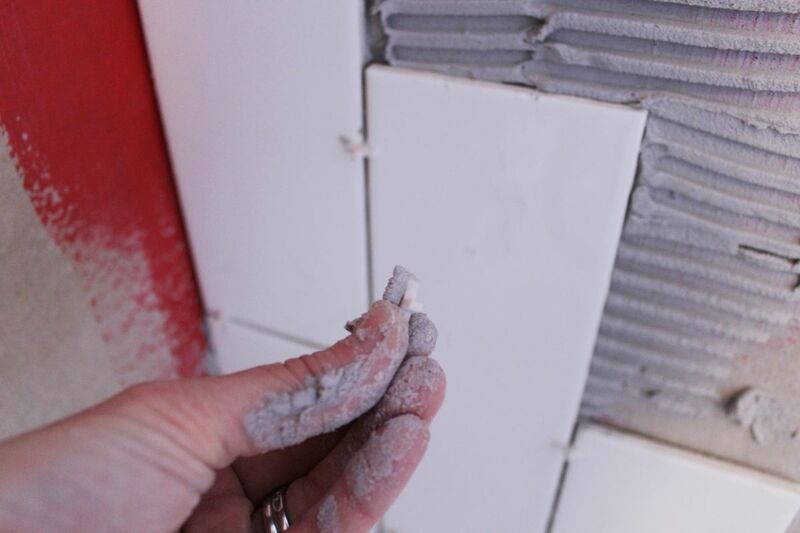 Double-check all tiles to make sure they are staying in place. When you’re satisfied that they are, let the thinset dry completely. Congratulations! 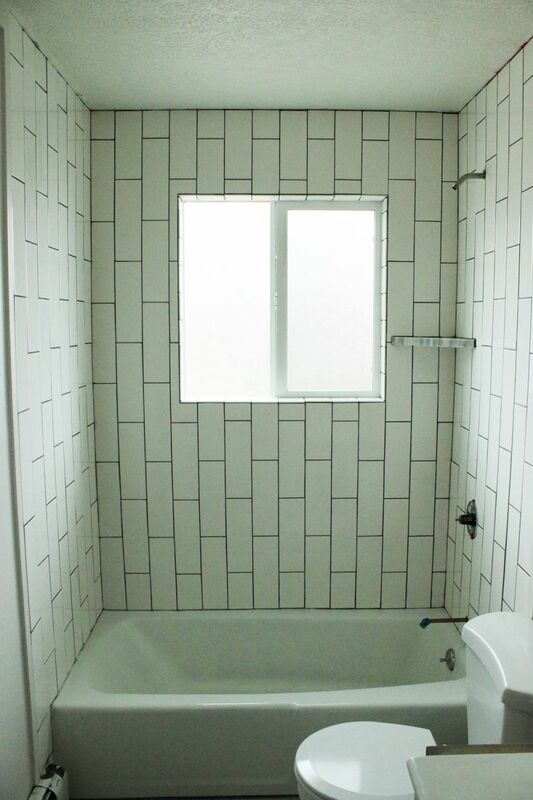 You’re just one step away from completing your tiled tub surround / shower! It’s looking beautiful. 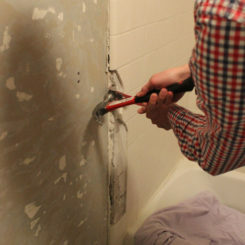 Be sure to check out our tutorial for grouting and sealing the grout to complete your project.